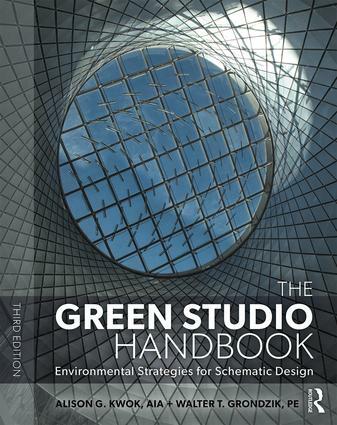 The Green Studio Handbook remains an essential resource for design studios and professional practice. This extensive and user-friendly tool presents practical guidelines for the application of green strategies during the schematic design of buildings. Students and professionals can quickly get up to speed on system viability and sizing. Each of forty-three environmental strategies includes a brief description of principles and concepts, step-by-step guidance for integrating the strategy during the early stages of design, annotated tables and charts to assist with preliminary sizing, key issues to consider when implementing the strategy, and pointers to further resources. Ten new in-depth case studies illustrate diverse and successful green buildings integrated design projects and how the whole process comes together This third edition features updated tables and charts that will help to save energy, water, and material resources during the early stages of design. More than 500 sketches and full-color images illustrate how to successfully apply strategies. A glossary, a project index listing 105 buildings in 20 countries, updated tables and drawings, and I-P and SI units increase the usefulness of The Green Studio Handbook. Alison G. Kwok, Ph.D., AIA, LEED-AP, ASES Fellow, is a registered architect and a professor of architecture at the University of Oregon. She has also taught in architecture programs in California, Hawaii, Hong Kong, Japan, Korea, and New York. Walter Grondzik, PE, LEED-AP, ASES and ASHRAE Fellow, is an architectural engineer and a professor of architecture at Ball State University. He has also taught in architecture and architectural engineering programs in Florida, Oklahoma, Oregon, and Saudi Arabia.